Irene writes: Our house in Los Angeles is 25 years old. One roofer recommended removing the composite roofing tiles and replacing the old underlayment with 90-pound paper. Then they will replace the roofing tiles. Another roofer recommended the same approach, but with two layers of 30-pound felt as the underlayment. Please explain the differences between paper and felt and the differences between using the 90-pound paper and the 30-pound felt? Is one better than the other? Steve Bliss, of BuildingAdvisor.com, responds: With a tile roof, the underlayment and flashings are critical as they create the primary water barrier. The tiles are mostly for aesthetics and to help protect the underlayment. Since the tiles, themselves, should last 50 years or more, the underlayment should be of similar quality. More often than not, the tile roofing outlives the underlayments and flashings. The terms “paper” and “felt” are used interchangeably and refer to organic felt paper, which is impregnated with asphalt and fillers to make roofing shingles and underlayments. Some products use fiberglass mesh rather than felt as the substrate. The term “90-pound paper” usually refers to gravel-coated roll roofing, which is a low-quality product that rarely lasts more than a few years when exposed to the elements. It weighs about 90 pounds per square (100 sq. ft.) because of the heavy gravel surface. I would not recommend it for anything other than a utility shed as the quality today is very poor. Two layers of ASTM 30-pound asphalt-impregnated felt is the minimum you should use under tile and should last 20 to 30 years. For a little more money, you can upgrade to a double layer of heavy-duty, SBS-modified asphalt underlayment such as VulcaSeal G40 (Fontana), Layfast SBS T35/43 (MB Technology), or Right Start UDL (Malarky Roofing Products). The fiberglass mat, SBS (synthetic rubber) additives, and 40-pound weight can increase the lifespan of the underlayment by 50 to 100%. Torch-applied membranes of organic or modified felt are commonly used as the second layer (the “capstock”) in wet areas like Florida, but are probably overkill in an arid region like southern California. ASTM No. 30 roofing felt is far better than unrated “30 pound” felt, which may weigh as little as 15-20 pounds. Courtesy of Tamko. There is a distinction between standard “30-pound” felt, which actually weighs 15 to 20 pounds per square and ASTM-rated #30 felt which weighs closer to 30 pounds and is of higher quality. ASTM-rated felt (under ASTM D4869 or the older D226) is manufactured to strict specifications, while standard 30-pound felt varies in quality from one manufacturer to another. Both are made with an organic felt mat impregnated with asphalt and various fillers. Some premium asphalt underlayments use a fiberglass mat instead of felt paper. Many roofers now prefer synthetic underlayments, which are lighter, more tear-resistant, and easier to work with than felt paper. There are wide variety of these with different warranties and projected lifespans. As with any new product, however, how long they will really last is unknown and manufacturing standards have not yet been established. Whatever underlayment is used, the installation is as important as the specific material. Most important are proper sealing and flashing at all penetrations for chimneys, skylights, pipes and roof vents. Valleys are also a problem area that need special treatment. I prefer an open valley design using a self-adhesive flashing membrane (such as Grace Ice & Water Shield) as the underlayment, covered with a heavy-duty metal flashing. Avoid aluminum flashing as it is will fail long before your tiles. In some markets, it is becoming more common to cover the entire roof with peel-and-stick, self-adhesive (SA) membrane. This is typically bonded directly to the roof sheathing. SA membranes self-seal around nails and other penetrations, can be exposed to sunlight for extended periods, and aggressively sticks to just about any material. It is a good choice for roof coverings that are easily penetrated by water — such as low-slope tile roofs in an area with windblown rain. For that reason, this approach is catching on in parts of Florida and the Gulf Coast. The main drawback, is that the underlayment is nearly impossible to remove when it comes time to reroof, so you may need to tear off and replace the roof sheathing at that time. Will Rain and UV Harm Exposed Underlayment? We are having a new tile roof installed in s. Florida. After the first layer of underlayment was installed, we had three days of back-to-back rain resulting in a leak within the house. Not sure if this is due to water penetration from a weak spot; but will have the roofer verify. Our bigger concern is whether or not the first membrane (specified as 30# ASTM D-226) is totally compromised after getting drenched. Also, how long will the membrane need to get fully dried before the next layer is applied? How long can it be exposed to UV? Thanks for your input. Organic roofing felt, like you are using, does not have any published exposure limit, but the rule-of-thumb is 30 days and it should be completely dry before roofing. 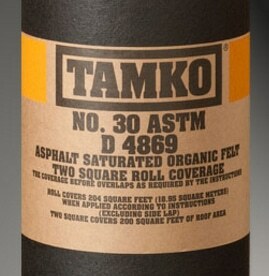 Technical reps at underlayment manufacturers such as Tamko will generally tell you that organic felt paper should be covered as soon as possible. All underlayments start to deteriorate from UV exposure as soon as they are installed. The longer it sits exposed to sunlight and heat, the shorter its overall lifespan. So hot regions with intense, bright sun like the Southwest would have the greatest risk of deterioration. The rule-of-thumb in the industry is no more than 30 days exposure for organic felt. But this is just a rough guide and will vary with climate and the quality and thickness of the felt. ASTM 30# felt is going to fare better than generic 30-lb. felt that does not meet ASTM standards. And 30 lb. is much better than 15 lb. Cheaper non-ASTM felt is lighter and more prone to absorb water. Non ASTM #30 felt can weigh as little as 20 lbs. (per 100 sq. ft.) vs. 26 -27 lbs. for ASTM #30 D-226 (also called Type 2). All felt paper is water-resistant, not waterproof. While moderate water exposure will not harm felt, it can cause wrinkling or bubbling, especially in cheaper and lighter felts. This can cause problems with tearing, sealing at laps, and telegraphing though shingles. With any roofing type, the asphalt underlayment should be completely dry before installing the roofing or another layer of underlayment. Usually that means a few days of sunlight, but it will vary with conditions. You should definitely have the leak checked out and repaired. With a tile roof, you want the underlayment to be completely waterproof as the tiles will allow some water penetration from windblown rain. Best of luck with your new roof. !